Bought to keep me company on a two-week trip to Greece, this guitar has gigged often since and always raises a smile. I tune it up to A and string with 10-46’s, and its single, direct-coupled Di Marzio (see rant) screams. It also does great ‘electric mandolin’ stuff. 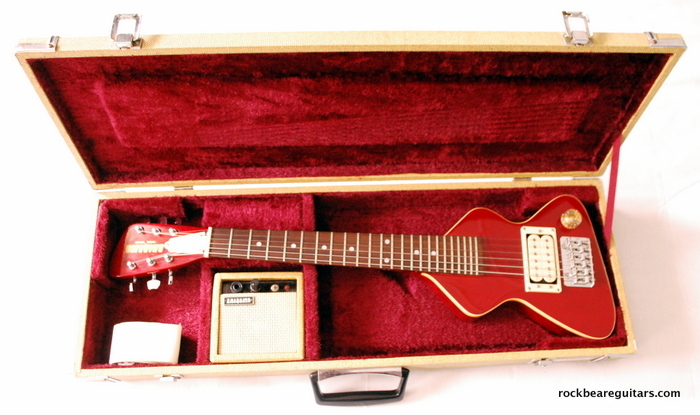 Its in great, original condition has its own original case and early 9-volt battery powered mini-amp, which records really well. The plain and simple white nylon strap belonged to a friend and is a memorial to and reminder of him. He died of a heart attack whilst on stage with us at a club in South London in 1984. A lovely lovely man, sorely missed. Got 1 = yours (difference: black t-rod cover + knob): The case + amp are still there. I see yours’s kept orig. : nice gauge+ tuning alternative. I changed tuners, added neck p-up (Ibanez G. Benson), double volume concentric pot (= no selector). Relocated the body strap-button to the corner. Went the other route w/ tuning: 4 Cello strings (steel flatwounds) for G-D-A-E + .018″ (B), .014″ (E). Standard tuning, a step below (D). Sounds BIG!